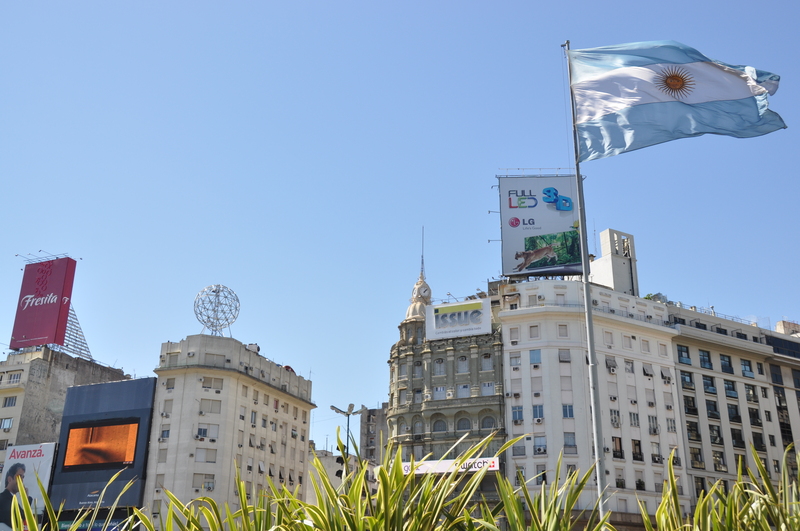 The Argentine flag flies in the glorious midday sun alongside the obelisk, while a nearby cluster of buildings and jumbotrons makes this particular intersection a sort of Latin Piccadilly Circus. 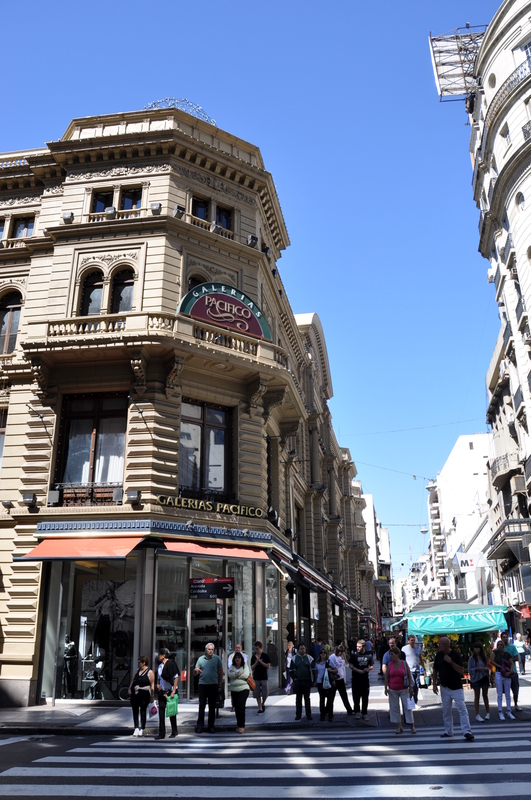 The downtown streets are crisscrossed by several pedestrian malls, alleyways closed to vehicular traffic and lined by gorgeous Baroque architecture. 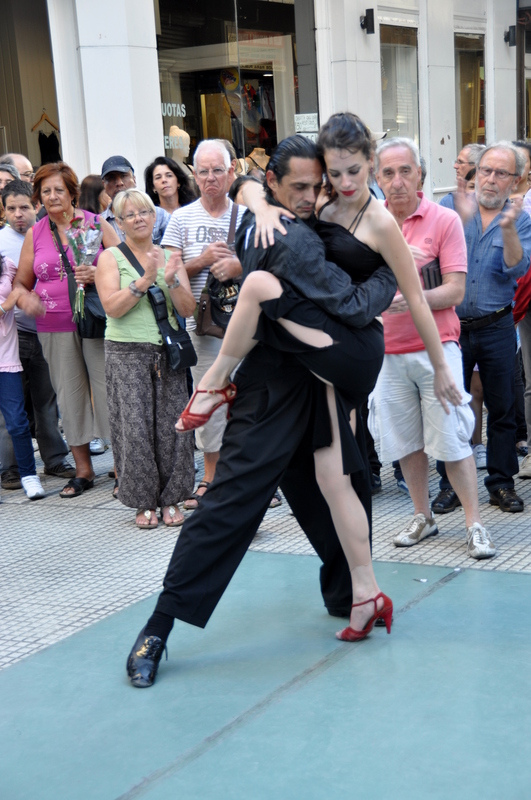 …and into open-air tango shows by day. 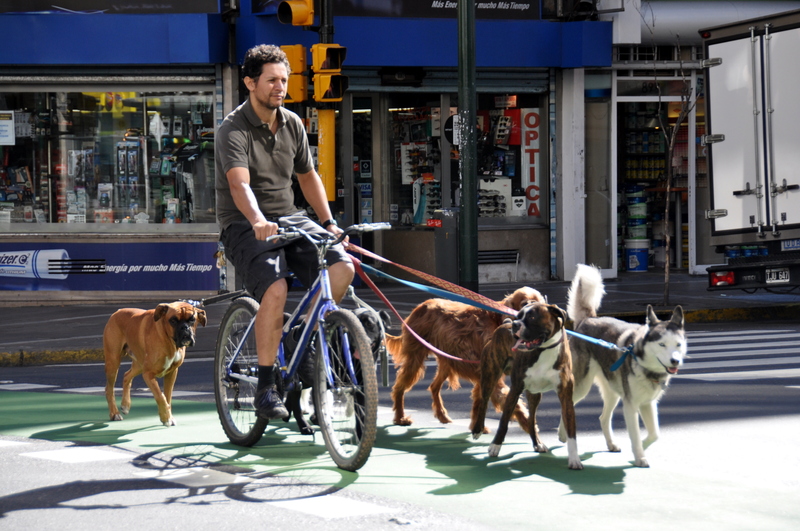 Dog walkers (and dog cyclists, in this case) are a common sight in Buenos Aires. Interior of the Pink House. 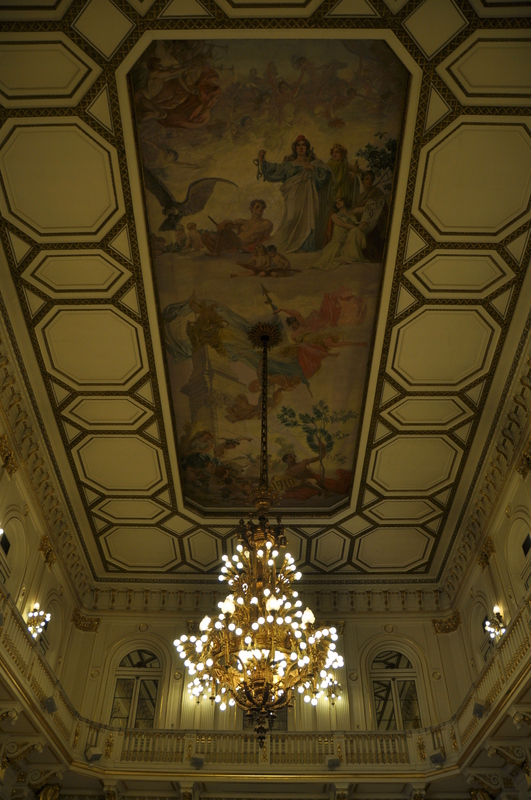 Check out that frescoed ceiling! 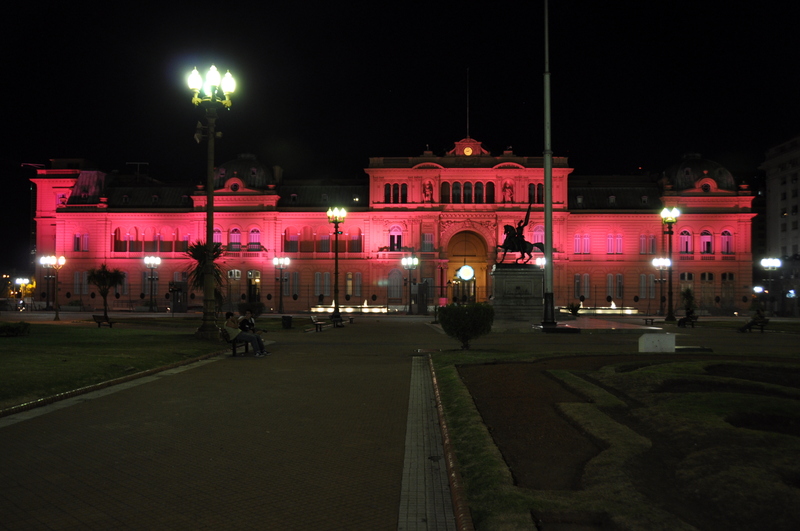 The Pink House at night, as photographed from Plaza de Mayo, a popular place for young lovers to stroll. 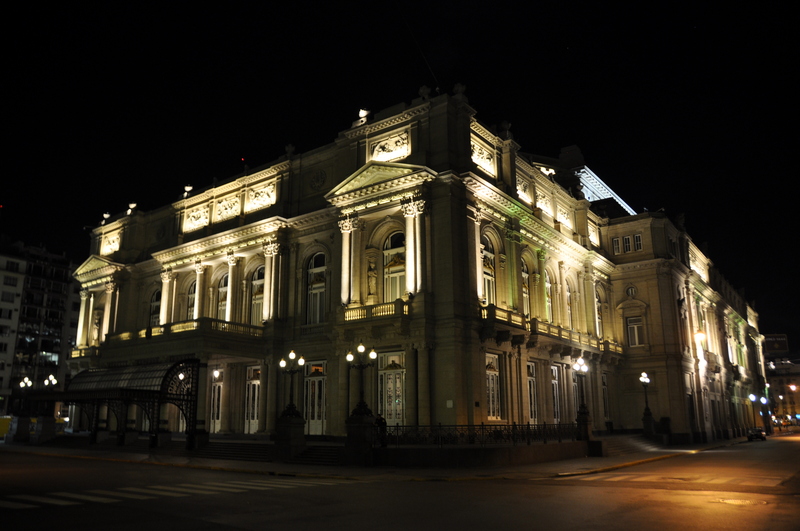 Another building that looks better at night than during the daytime: Teatro Colón, considered by Acoustics Today magazine to be the fifth-best concert hall in the world in terms of acoustics. 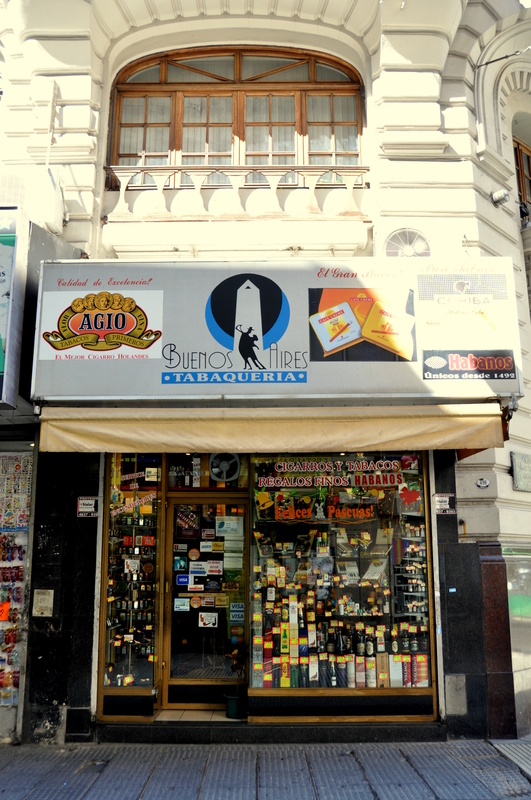 I love the facade of this tabaqueria, located on pedestrianized Calle Florida. 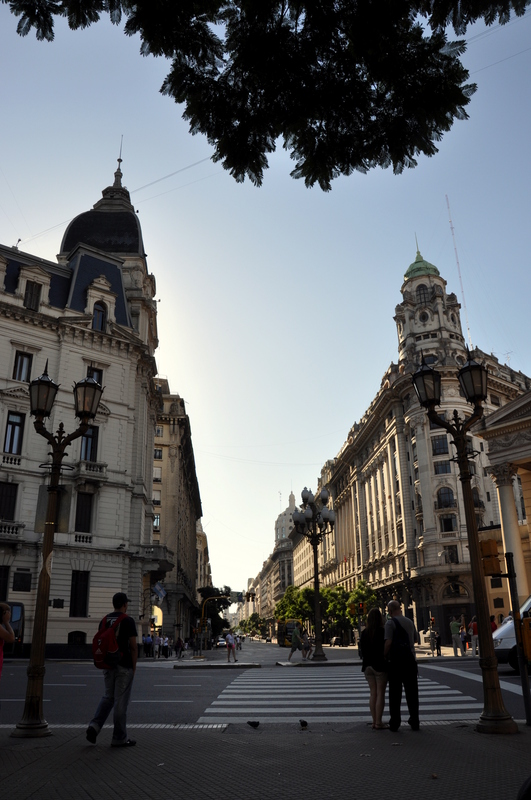 Travel further afield, by subte (subway) perhaps, and you can visit Recoleta Cemetery, where Eva Perón is entombed. 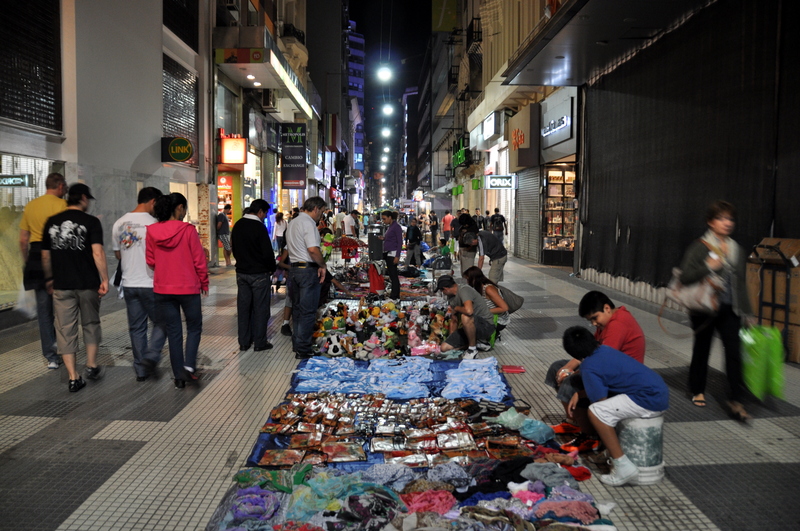 A chaotic bus ride in the opposite direction will take you to the colorful, soccer-worshipping neighborhood of La Boca. 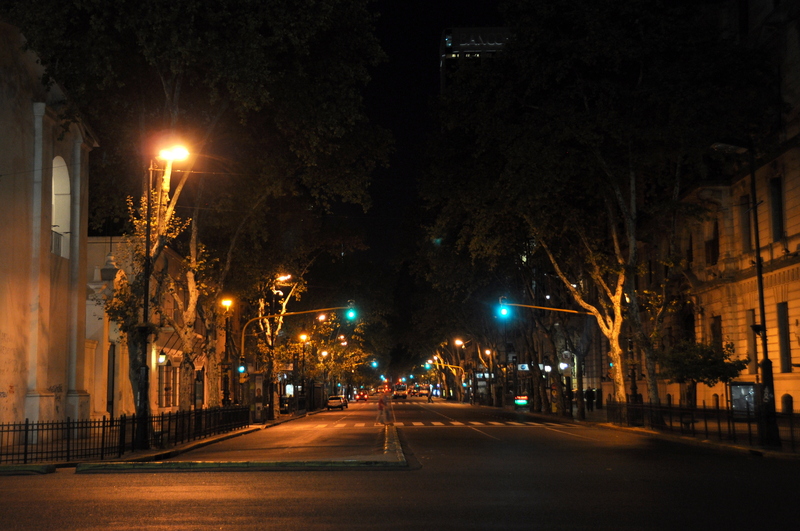 But downtown BA, where the street lamps and architecture seem to have been transplanted from of Paris, London, or Barcelona, is the place for me. 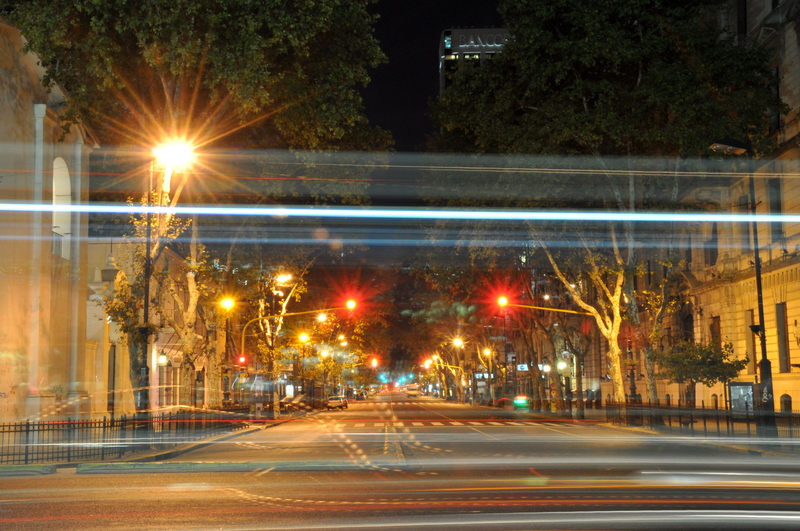 I haven’t spent nearly as much time in Buenos Aires as I have in Paris, but I’d like to change that. The same goes for Argentina as a whole. 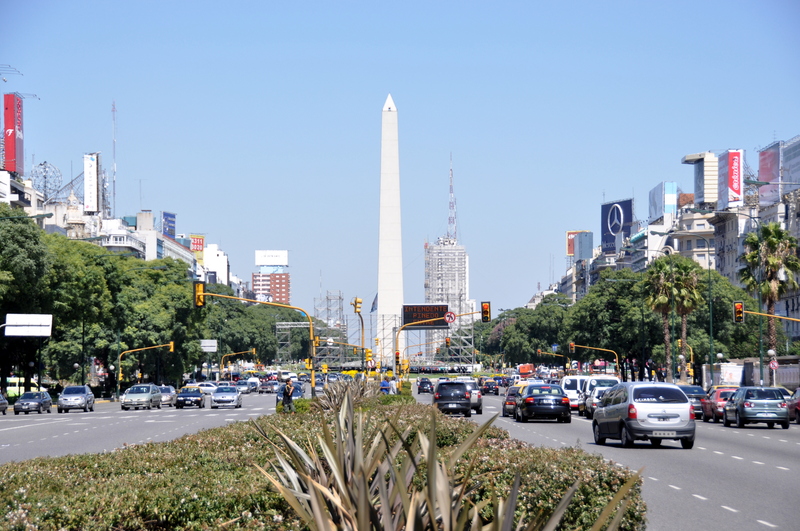 Yes, there is a great deal more to Argentina than Buenos Aires. I did do a tour of one of the ranches on the Pampas outside of the city and I went to Iguazu Falls (I was actually on the Brazilian side). But I would love to go back and see more. 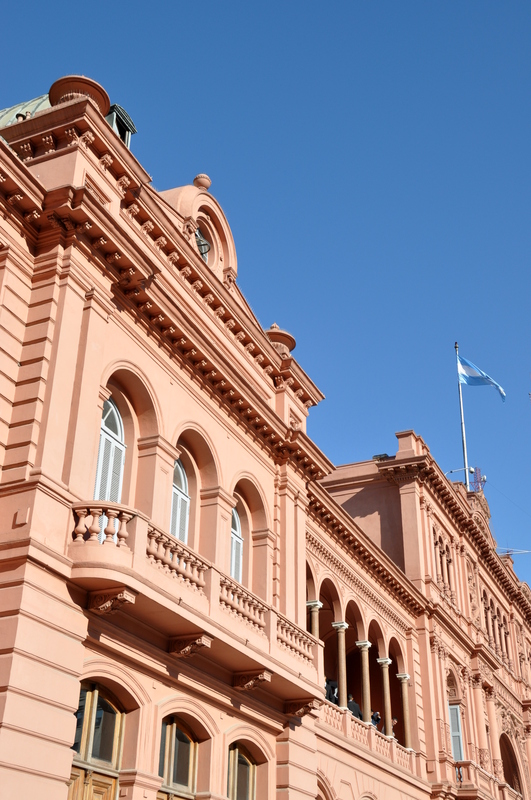 I would love to see the Pampas, and the desert near Salta, and Argentine Patagonia of course. I like Hong Kong also. I could feature that in a future gallery, although my pics are from a *really* old camera and not of the best quality.